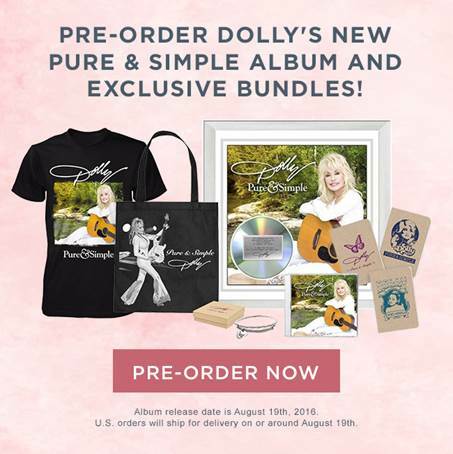 Dolly Parton Announces Album Pre-Order Bundles And Releases Lyric Video For "Pure & Simple"
Standard Bundle ($40) – Pure & Simple album cover art on black 100% preshrunk cotton t-shirt, Pure & Simple CD, as well as an album digital download (will be delivered via email on August 19th). 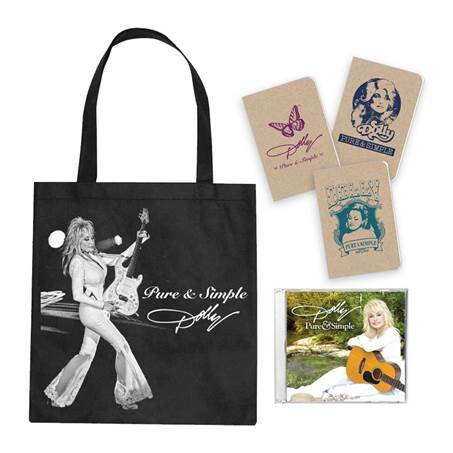 Deluxe Bundle ($60) – Pure & Simple CD, as well as digital download of the album (will be delivered via email on August 19th), a 3 notebook set with different Dolly logo designs (each notebook measures 3.5″ x 5.5″), and a Rhinestone and lace Dolly photo tote bag. 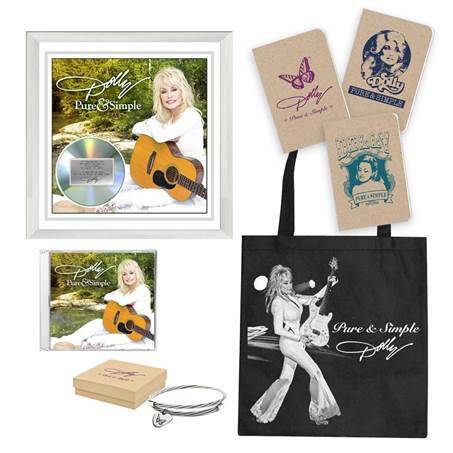 Collectible Bundle ($100) – Pure & Simple CD, as well as a digital download of the album (will be delivered via email on August 19th) , a collectible Dolly guitar string bracelet and custom gift box, a 3 notebook set with different Dolly logo designs (each notebook measures 3.5″ x 5.5″), and a Rhinestone and lace Dolly photo tote bag. 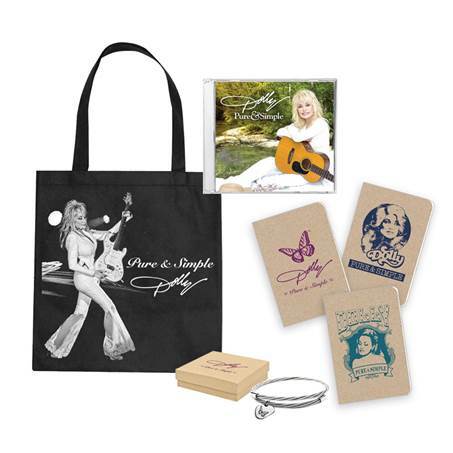 Commemorative Bundle ($400) – Pure & Simple CD, as well as a digital download of the album (will be delivered via email on August 19th), a collectible Doll y guitar string bracelet and custom Dolly logo gift box, a 3 notebook set with different Dolly logo designs (each notebook measures 3.5″ x 5.5″), and a Rhinestone and lace Dolly photo tote bag, and a 16″ x 16″ Collectible Limited Edition plaque commemorating the release of Dolly’s new album Pure & Simple (each plaque has the cover art and an official certificate of authenticity plate inside). Fans can go to shop.dollyparton.com for more information regarding the bundles. In other Dolly news, the entertainment icon has just released the title track lyric video, which can be viewed here: dollyparton.com/life-and-career/music/pure-simple/12058. 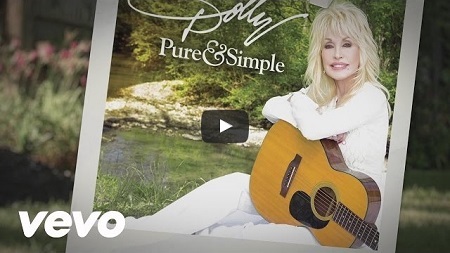 “Pure & Simple” has caught the attention of digital retailer iTunes, which named Dolly’s track to their “Best of the Week” playlist. Fans can access the list by going to apple.co/BestOfTheWeek.